Find your dream Fiat car today at Carsnip. We’ve got over 10,239 used Fiat vehicles available, and our intuitive search system means that you can make the best decision in the easiest way. We’ve made buying your next car easy. Browse over 10,239 vehicles below. 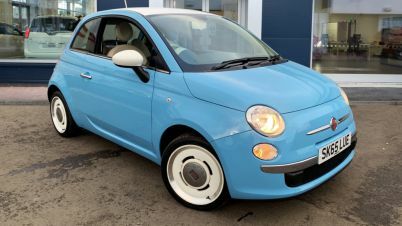 Fiat 500 1.2 Lounge (s/s) 3drFINANCE FROM £25 PER WK! Fiat is an Italian carmaker with its roots in the 19th century. Known for chic design at an affordable price, Fiats are popular and compact vehicles. In particular, the Fiat 500, of which there are thousands on Carsnip, has proved incredibly successful in the UK. With retro looks and great fuel economy, this isn’t too surprising. Other popular cars such as the Panda and Punto are worth a look if you’re after an affordable hatchback.